The inherent grace and pain in gymnastics is juxtaposed with the harsh industrial landscapes of one of the most polluted and industrially brutal places in Russia. "It is an attempt to capture the fragile beauty of the place at the present moment, constructed from the stain of memory it left behind." Probably the world’s most beautiful sport, gymnastics remains a daunting challenge for the young girls who dream of one day winning Olympic gold. Almost all Russian girls encounter the same crossroads early in life: they are selected for either dancing (ballet for the most talented) or rhythmic gymnastics. Russia's rhythmic gymnastics team has always had a strong stable of gymnasts. According to the Russian Rhythmic Gymnastics Federation, the Russian regions are home to 300 dedicated training schools. 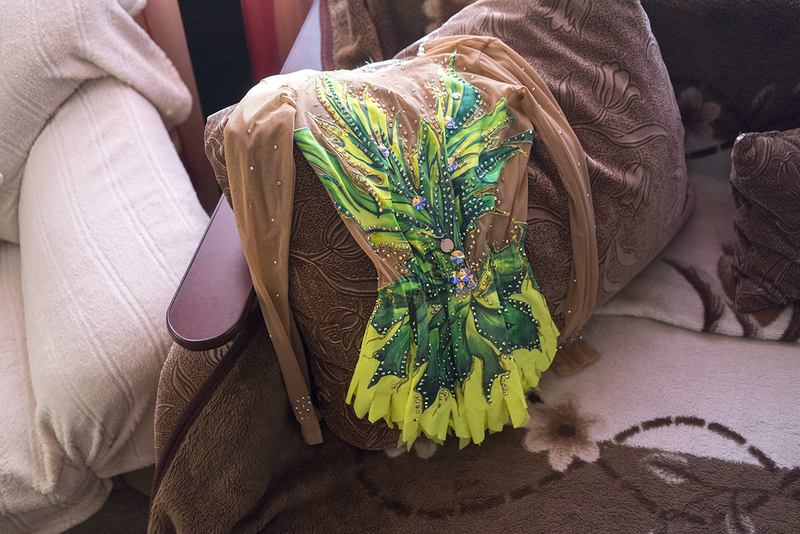 As usually seen from the other side, rhythmic gymnastics is a harmonious blend of art and dance. "This sport emphasizes femininity in girls, which is also inherent in Russian culture itself," according to the photographer Maria Babikova. "A girl is taught to sculpt her body, perfect her moves, and be graceful at all times, which can only be achieved through endless tedious repetition. From a very early age, she becomes aware of her body and the hypnotizing effect it can have on the viewer." "At this vulnerable age the biggest and harshest lessons of life are learned, mostly during training sessions. Coaches and families push for the perceived ideal—be it social success or simply a slender athletic body." The series is focused on the periphery of the sport, not the competition itself, but what happens prior to it. That’s what interests me the most," says Maria, the author of the photos. "The Harmony Series is a project deeply rooted in my personal history. The series is named after the Harmony School of Rhythmic Gymnastics, where I spent most of my childhood," continues Maria. The school is based in Maria's hometown of Chelyabinsk (1773 km from Moscow), which sprawls from the edges of the mineral rich Ural mountains. The local nature is highly contaminated by the heavy metal industry. "The city plays a crucial role in the series. Given the limited resources and options Chelyabinsk has to offer, this sport becomes almost a necessity, a way of social mobility for young girls." The Chelyabinsk meteorite two years on: What have we learned? What is a “Palace of Culture” and who “rules” there?